At first, Virgo and Aries seem a very unlikely match. The quiet, reserved Virgo may be taken aback by the outgoing, daring ways of Aries. Yet, when they meet up, there is certainly passion. Aries is drawn to the mysteriousness of Virgo and Virgo is intrigued by the adventurous Aries. There is an element of magnetism in this love match but the longevity of this relationship is not certain. Aries needs stimulation and excitement while Virgo needs safety and security in the relationship. However, as the Fire element of Aries mix with the Earth element of Virgo, it makes a difficult combination. Glitches arise from their differences in personalities. Virgo will see Aries as somewhat reckless, and feel they are not taking anything seriously and Aries may see Virgo as being harsh and over critical at times. Aries detests any form of criticism. They have a tendency to be impulsive while Virgo ponders over an issue for a long time before taking any decision. On the financial front an Aries is a spendthrift and Virgo spends wisely. Where Virgo may want Aries to be more sensible and practical, Aries may regard Virgo as being too much of a worrier.The Arian needs to control his rash nature and Virgo has to stop nagging and criticizing. Will it work out between Aries and Virgo? Possible, since these very differences can be the foundation of a strong relationship between Virgo and Aries. They just need to be willing to focus on each other’s strengths. In due time, admiration and respect for each other will grow. Aries will be impressed with Virgo’s ability to be calm and level-headed in most situations and Virgo will master the art of self-confidence from Aries. Aries teaches Virgo to take life a little less seriously. Virgo teaches Aries to be patient and pay more attention to the little details. Virgo and Aries are both thoughtful and genuine in character and with persistence, patience, and deep understanding from both, they can form a solid relationship. The intelligent and mature soul of a Virgo woman truly compliments and respects the highly enthusiastic and charming personality of an Aries man. This relationship has beautifully merging contrasting emotions, feelings and practicality. Though both these Zodiac signs have very different points of view towards life but they are always there to love, support and help each other in every situation. Virgo lady is very mature and practical. She is always very supportive of her man. She always guides him with her intelligent advice and suggestions. But because of her criticizing nature she doesn’t spare anyone from her analysis. When she is in a relationship with an Aries man, she finds the perfect love and loyalty which she has always desired for. She may not find him as mature as her own self but she will always adore his fresh ideas and charming personality. She doesn’t like to fake or manipulate. The couple shares a beautiful understanding and feeling of trust which helps them take their relationship to higher levels. Astrologically speaking, getting involved in a relationship will not be uneasy for an Aries woman and a Virgo man. The strain will be experienced in keeping the spark alive. He lives in the future, but she lives in the moment. Her spontaneity may clash with his tendency to remain organized. He wants to plan everything which may seem like a boring chore for her. The only plus point is that he will respect her goals. The compatibility of this love match will be on the track provided they manage to bridge the gaps. Together the Aries woman and Virgo man have contrasting personalities. They are totally different from each other in almost every way. He is very careful and attentive person while she is a careless bird. He likes everything to be perfect and neatly organized. She is more interested in adventure and excitement rather than any boring plans. He lives in the future but she lives in the moment. Her spontaneity may clash with his tendency to remain calm and organized. Though it is very easy for these two to be drawn together but the strain is experienced in keeping the spark alive. On a good note, an Aries woman always gives a Virgo man the energy and spark, he lacks in his life. She is a fan of his intelligence and appreciates every aspect of planning and working. She is someone he can lean on and is beside him like a solid rock in all ups and downs. Her reliability and courage is something that drives him crazy and he is ready to be her partner to fulfill all her exciting dreams which fill enthusiasm in his life too. 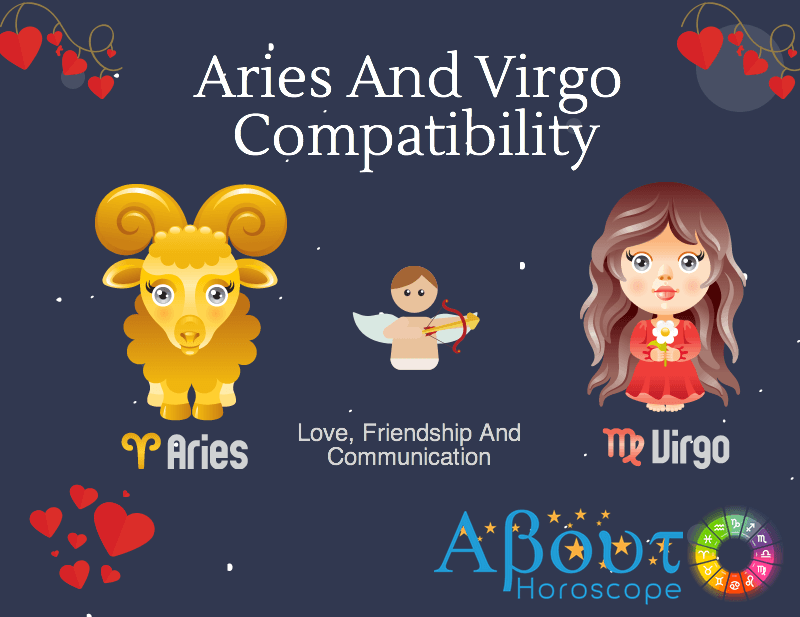 Virgos and Aries are on different wavelengths and though Virgos find Aries exciting and Aries finds Virgo’s intelligence admirable; they need to handle their differences in properly. Aries are very innocent and lovable, but their ego and impulsiveness may dampen the spirit of a fragile Virgo. And on the other hand criticizing is a part of Virgo’s nature and Aries may get affected and annoyed with her critical remarks. But they have a lot to learn from each other. When he starts understanding and respecting her personality, then she opens up and discusses her problems with him. And once he becomes aware that her reason of criticism is just her attitude and nothing personal, he starts taking her advice seriously. The practicality and maturity of a Virgo compensates for the charming and child-like Aries. This love match has the potential to be filled with colors of love, passion, loyalty, trust, understanding and care which makes it special and perfect.